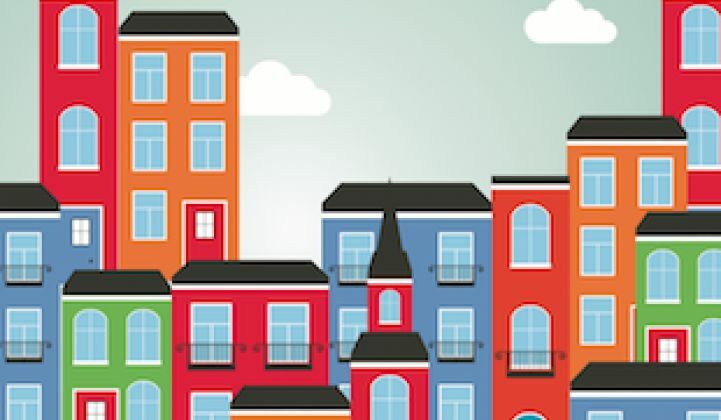 Conventional wisdom says that buildings are a sprawling, untamable black hole for energy. But a new analysis of federal data shows that the U.S. buildings sector has made enormous strides in efficiency over the last six years -- potentially eliminating the need to build any new power plants to support growth in the sector through 2030. 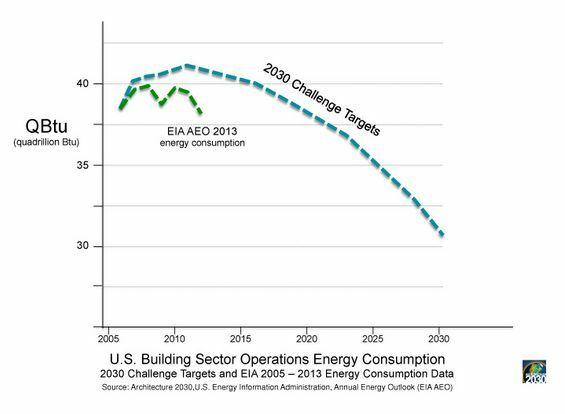 When sustainable architecture guru Edward Mazria looked at the EIA's latest Annual Energy Outlook, he noticed two surprising things: one, that 2030 projections for building energy consumption continue their steep decline; and two, that America plans to add over 60 billion square feet of new buildings by then. So even as a huge portfolio of new buildings is constructed in the next two decades, the energy needs in those buildings will be low enough to prevent the need for any new power plants to service them, concluded Mazria. "There is no longer any need to build power plants to meet growth in the buildings sector," said Mazria. "This is a monumental shift." In the EIA reference case outlined below (assuming no technological or policy changes), demand for new electricity capacity doesn't reach 2013 levels until about 2025. In the two other scenarios, assuming the building sector -- which accounts for 73 percent of electricity use -- makes either modest or strong improvements in efficiency, there is a wide range of potential to actually shut down plants. The "high demand" and "best available demand" scenarios are looking increasingly likely. 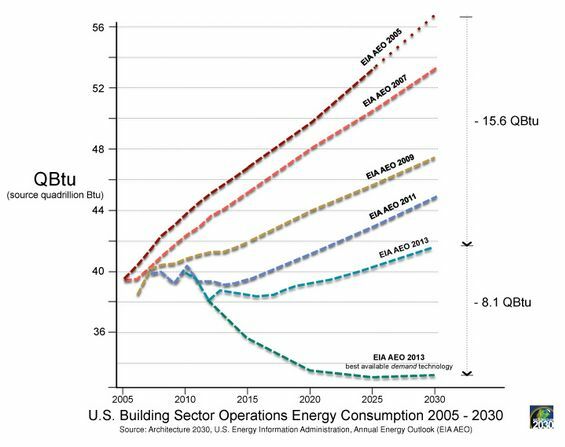 EIA projections for building energy consumption have been shifting downward since 2005. Even more strikingly, if architects and builders were to implement "best available demand technology" on new projects and renovations, they could cut demand in buildings by more than eight quadrillion BTUs of energy and reduce the equivalent of 145 gigawatts of power plant capacity. Considering that agencies like EIA consistently underestimate technological change in the efficiency and renewable energy sectors, it's quite feasible that the sector follows a more aggressive downward trajectory, as shown in the following figure. 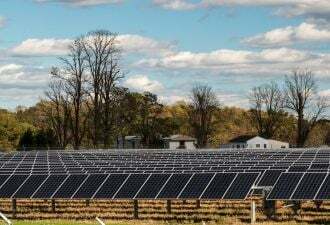 The reality, however, is that hundreds of gigawatts of new power plants will still get built to replace retiring plants and service other areas of the economy. But Mazria's analysis shows that buildings are becoming an increasingly smaller factor in that growth. In 2002, very few people were paying attention to energy consumption in the built environment. 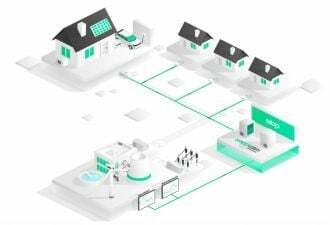 But interest in the sector piqued when Mazria founded the group Architecture 2030 and started raising awareness about the fact that buildings account for nearly 50 percent of U.S. energy consumption. Three years later, Mazria created the Architecture 2030 challenge that set targets to make new buildings carbon-neutral by 2030. 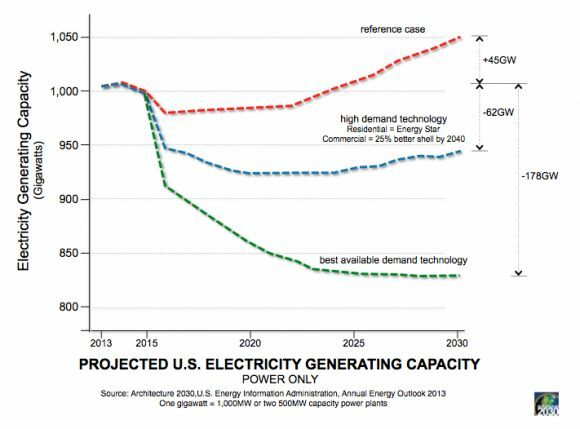 Those targets essentially mirror the EIA's "best available technology" scenario. The 2030 challenge, along with the rapid growth in the U.S. Green Building Council's LEED rating system, helped thrust buildings into the discussion around climate change and a transition away from fossil fuels. "Before 2006, everyone thought SUVs were the problem. You couldn't find an article on buildings. Then the buildings sector finally came onto the scene, and now you can't get away from it," said Mazria. Mazria hopes Architecture 2030's latest analysis will once again transform the way people think about energy use in the built environment. "This is huge. I don't think people truly understand what just happened," said Mazria. "We have essentially created a moratorium on new power plants through efficiency gains in the built environment. We are already beating the targets that we set six years ago." This is the second piece of surprising news in the efficiency industry. 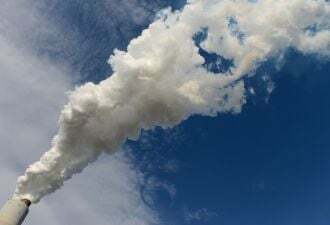 Last week, analysts at CO2 Scorecard concluded that economy-wide efficiency efforts were responsible for three-quarters of the carbon dioxide emissions reductions in 2012 -- not natural gas, as was commonly thought.